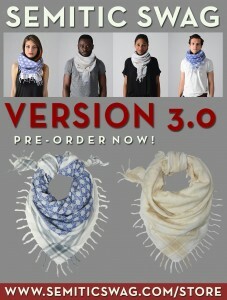 Introducing the 3.0 version of the epic Semitic Keffiyeh! The new version is bigger measuring 44×45″, 100% Cotton with a contrasting strips and the Star of David throughout. A tonal rendition of the keffiyeh is a subtle stylish way to express your Semitic pride. The latest version comes in your choice of our original Blue and White with stylish matching grey lines around the other edges and a white and beige color which is the perfect accent accessory for most any wardrobe.